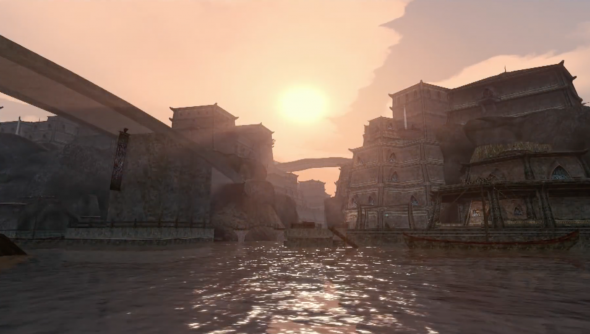 In the last 16 years, over 600 modders have contributed thousands of new assets – everything from art and music to complete towns and cities – to Tamriel Rebuilt, a community that’s constructing a mainland for The Elder Scrolls III: Morrowind, whilst preserving the game’s creative vision and direction. To celebrate 16 years of the community, the team has released a new teaser (above) showcasing the latest version of the mod. Looking for more on Morrowind? Here’s how ZeniMax are faithfully realising Morrowind in Elder Scrolls Online. Thought to be one of the largest Morrowind mods available, it offers you the chance to explore the mainland’s secrets, complete with quests, dungeons, and hidden treasure, “from the highest peaks of the Velothian Mountains, to the lowest swamps of the Grey Meadows, the barren flats of the Armun Ashlands, the maze of canyons of the Roth Roryn, and the fertile farmlands of the Thirr River valley”. To get involved yourself visit Tamriel-Rebuilt.org, or head here to grab the latest build.